Love is in the air: Erollisi Day has returned! This year the event will begin at 12:01am PT on Thursday, February 4th and conclude 11:59pm PT on Wednesday, February 17th. There are two new quests, a new recipe scroll, several merchant items, and a handful of achievements to enjoy on top of all previous returning content. 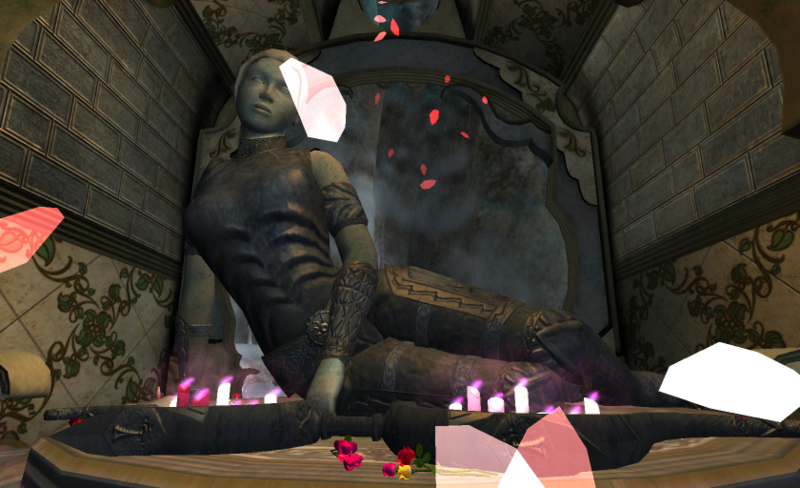 (NEW) Heart of the Shattered Lands Collect love loot from races that found refuge in Qey & FP. (NEW) Doomed Lovers Collect love notes and candy from the undead. (NEW) Thalumbra Lovers Do It Deep Collect love notes and candy in Thalumbra. (NEW) Passions of Kunark Collect love notes and candy throughout Kunark. (NEW) Love Found in Innothule Collect love notes and candy throughout Innothule. (NEW) Love on the Shattered Seas Collect love loot in the Tranquil & Phantom Seas. (NEW) Love is Eternal Collect love notes and candy throughout the Ethernere. (NEW) Burning Passions in a Frigid Land Collect love notes and candy throughout Velious. (NEW) Hearts Across Faydwer Collect love notes and candy throughout Faydwer. NOTE: Only complex returning quest guides (as determined by Cyliena) are included below. Leave a comment if there’s other quests that would benefit from being listed as well! Leave the chapel and head south again. Click on the hidden door on the southern face of the wall at /loc -20, 0, 67. TO START: Given by a volunteer guide on live servers. On Test speak to Brosha the Brokenhearted at /loc 51, -43, -837 in The Commonlands. Spend your Erollisi Coins with Douglas at /loc -211, -56, 6 in EFP or /loc 822, -23, 59 in QH. *This item will become convertible into a house item at a later date. I generally try to find things out for myself (at least initially) but game time has been dreadfully short lately, and I appreciate your guide so very much! You’re welcome. 😀 Is the new quest tracker working out well? Awesome as always. With the quest tracker, you might mention that users are able to File -> Make a Copy if they dont want to print it out. Love the google docs approach. Thanks so much! How do you get the candy/love notes? I’ve been killing mobs from the list for half an hour but I still haven’t found any on them. Are there specific types you’re looking for (for the new achievements) or are you just trying to mass-gather for crafting? Sorry for the delayed response, been busy with classes. It may depend where you’re killing, or possibly the new achievements have affected drop rate. If you think a mob should be dropping love notes/candy and aren’t, make sure you report it over on the official forums. Obtaining holiday harvests from the pack poney was the easiest way to get the achievements – though I’m still working on them. Seems there area few that are hard to get… I cleared an entire zone of Brokenskull pirates – and nothing.